for BOTH sewer & water, and are proud to say our reputation speaks for itself. *All originals are on file in our office. We received our inspection certificate in the mail today. We are now in compliance with the City of Golden Valley. My husband and I are so grateful for the careful work that Dan, Kyle, Dave, and Hout did so please thank them for us. We can now rest more easily knowing our sewer is functional for another 50 years or so. Thank you so much for the quick, professional work you did on our sewer repair. It was an excellent experience working with your company, and I would be happy to act as a reference for you. I want to thank you for your prompt, thorough and wholly professional sewer pipe repair. I can't tell you how relieved we are! I felt we were in very good hands. Please tell Kyle and Hout what a good job they did and how relaxed they helped us feel while they were here! Email Received - thank you - your crew was very professional and left my yard looking great. Nice Work. Thank you Dan & Crew! Great effort for a tough job! Thought you'd like to know: I was very impressed with your professionalism. You were the only ones who said you knew to call Golden Valley for the information. I'm sure others knew but was a big plus for me to be told. I check with Edina Realty to see if they had any feedback on who had done this type of work in Golden Valley. . . hands down you were the best. Once the job was done, I went out expecting to have to resod. Great job and I've only had to keep watering the grass. Great Job! I received the email and printed the invoice this morning at my office. Thanks for the excellent service - no leaks so far!!! To date, from perspective the job went very well - if you ever need reference please let me know. Dan, It is difficult to write this big check for dealing with "#*&! ", along with a thank you note for doing it! But, I do thank you for your good nature and your integrity -- I appreciate both! Thank you for the Professional Job of installing the new water line. Thanks for the itemized statement. Dear Kyle, Here are photos from yesterday. Good thing you did it yesterday! The City closed our street today & is digging up outside to bring in water. . . a mess. Thanks for the good job!! I've planted seed & am watering. You were all fun to have here & left everything in great shape. Many thanks! Thanks so much for your speedy and skilled work you did at my house last week. My wife Molly, had nothing but nice things to say, and I think your backhoe and all the related activity was probably the highlight of our kids' young lives. I also appreciate the phone calls from you I had before the project started and while I was in Florida. Thanks again for your quality service! Thanks for a job well done. You made a very unpleasant situation easy and took the stress out. We are grateful. Dan and crew did a great job. They were punctual, completed repairs in record time and kept the worksite very orderly. Would recommend this company to others and definitely would hire this company again! 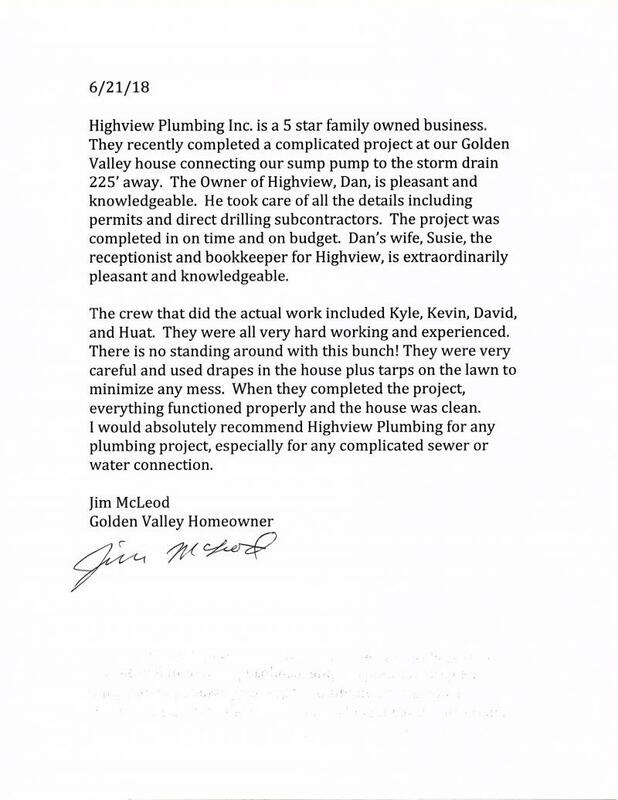 Dan from Highview Plumbing was very knowledgeable and very concerned about doing the job right. The city required that we have our sewer main lined in order to get a certificate we may need if we sell the house. I solicited three bids and selected Highview. They did a great, quick job. It required excavation in our front yard, which they handled fine and did a nice job of retaining and returning our sod to its position. It was a great experience. Dan did an excellent job and had the right equipment for the job and got it done quickly and cleanly. Dan had a pneumatic device that could bore underground from my house to the water main so we did not have to dig up my backyard. He was efficient and conscientious. On the finer points, Dan laid drop cloths everywhere and cleaned up after himself when the job was done, and that separates the good from the best, in my opinion. Excellent work. The crew was timely and professional. Got the job done even though there were a few surprises. Highview did a stellar job for us and at a reasonable price. * 2010 Super Service Award winner. Copyright 2009 Highview Plumbing, Inc.. All rights reserved.